The American Public Transportation Association (APTA) selected Eugene, Ore.-based Lane Transit District (LTD) as the 2014 Outstanding Public Transportation System for agencies that provide more than 4 million and less than 20 million annual customer boardings. LTD is joined by Tri Delta Transit of Antioch, Calif. (fewer than 4 million customer boardings category), and the Utah Transit Authority (more than 20 million annual customer boardings) as this year’s winners. To commemorate the award, LTD partnered with Falling Sky Brewing on the creation of Mash Transit Ale. A long-time supporter of alternative transportation, Falling Sky unveiled Mash Transit Ale during the celebration event earlier this week. Mash Transit Ale t-shirts are available for purchase at Falling Sky. Proceeds from the ale sales will go to the Lane Coalition for Healthy Active Youth. Plus, wearing your Mash Transit Ale shirt allows customers to ride free on any LTD bus every Sunday throughout 2014. LTD also introduced the Transit Trail Map. 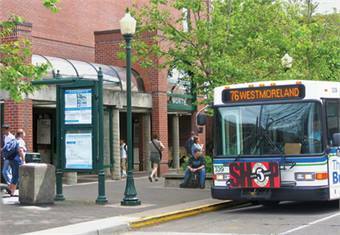 The Transit Trail Map allows participants to take the bus to a variety of businesses throughout Eugene-Springfield and collect a stamp on their Trail Map. Once eight stamps have been collected, participants will be given a Mash Transit Ale shirt or a commemorative travel mug. More stamps mean bigger prizes, including free rides on LTD for a year! LTD will be presented the Outstanding Public Transportation System award during the APTA Annual Meeting and EXPO in Houston on Oct. 13 to 15, 2014. Systems are recognized based on quantitative and qualitative criteria.